Note: We are currently redesigning County Florida to bring not just a fresher look, but fresher content. Other projects have taken some time away and we have not delivered the up-to-date content that we originally set out to provide. We appreciate your patient during this process and hope you will consider visiting some of our sister sites that have taken some of this time away from this project. They are current and complete which will now allow us to shift our focus back to providing detailed and current information about florida county government information and other news. In the meantime here are some of the other projects as well as a quick summary of Florida in general. Doctor Lookup by eHealthScores - Nursing Homes - NPI Lookup for doctors and health care professionals. 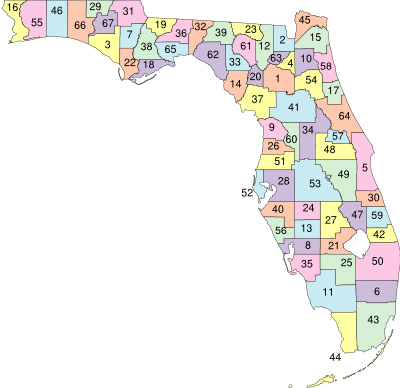 Florida is situated mostly on a large peninsula between the Gulf of Mexico, the Atlantic Ocean, and the Straits of Florida. It extends to the northwest into a panhandle, extending along the northern Gulf of Mexico. It is bordered on the north by the states of Georgia and Alabama, and on the west, at the end of the panhandle, by Alabama. It is near the countries of the Caribbean, particularly the Bahamas and Cuba. At 345 feet (105 m) above mean sea level, Britton Hill is the highest point in Florida and the lowest highpoint of any U.S. state. Contrary to popular belief, however, Florida is not entirely "flat." Some places, such as Clearwater, feature vistas that rise 50 to 100 feet (15-30 m) above the water. Much of the interior of Florida, typically 25 miles (40 km) or more away from the coastline, features rolling hills with elevations ranging from 100 to 250 feet (30-76 m) in many locations. Lake County holds the highest point of peninsular Florida, Sugarloaf Mountain, at 312 feet (95 m).